"This is Liam. Liam has lots of friends who love him and want to play with him. Sometimes Liam goes to his friends' houses to play. Sometimes Liam's friends come to his house to play. When we get together with friends, we greet them by looking at their face and saying, 'Hi'. We don't look down or look away and say nothing. We don't run off when friends arrive. They will think they don't want to play with us! "Introductions can be awkward for many children. For some, however, making eye contact, and acknowledging another person by simply saying 'hi' can be a constant challenge. 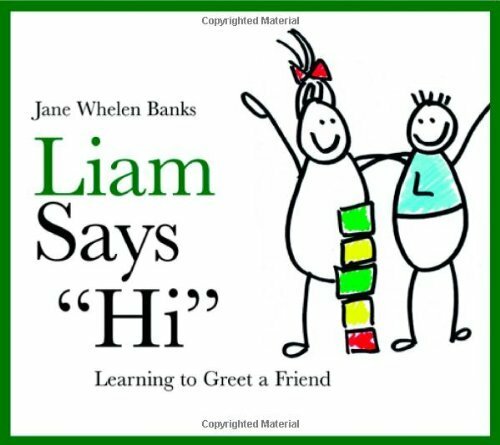 In "Liam Says 'Hi'", Liam manages to overcome his shyness and complete the steps necessary when greeting a friend at the front door. Appropriately welcomed, Liam's friend enters the house and both children proceed to have an excellent play date.Vibrant, colourful and lively, this book's positive messages and advice are ideal for young children wanting to understand social situations or how friendships work.